Reclaim the Night 2015 is coming! 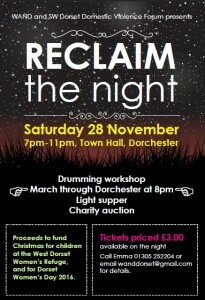 This year’s Reclaim the Night event will be held on Saturday 28 November from 7pm-11pm at the Town Hall in Dorchester. As usual WAND is hosting the event to link in with “International End Violence Against Women Day” held each year on 25 November. The money raised from the auction will go to the the women and kids at West Dorset Woman’s Refuge, including enabling the e children to buy a present for their mums just from them. Last year we raised £480 at event (including a couple of generous donations). Following the success of last year we are welcoming anyone who wishes to support an end to violence against woman so this will not be a female only event and is open to everyone. There was a real family atmosphere last year so please come along to event which promises to be a fun event despite its serious message. If you’d like to donate a prize for the auction please contact wanddorset@gmail.com. 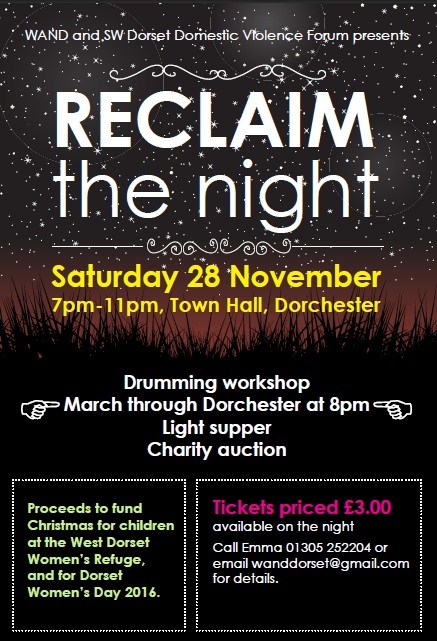 This entry was posted in Activity, Event, Fundraiser and tagged auction, Dorchester, drumming, fundraiser, Reclaim the Night on October 25, 2015 by mariac.